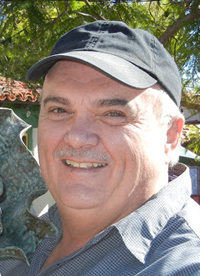 Paul Linsley has been a studio sculptor and ceramic artist for over 20 years in San Diego. He received his Bachelors in Applied Arts from San Diego State University, and studied further with Dr. John Conrad at Mesa College. Aquatic sculptures are his primary focus. "The ocean in its immensity, dominates all that it comes into contact with. Its strong influence on my life is reflected in these Aquatic Sculptures." These Aquatic Sculptures are a unique line of ceramic sculptures thrown on a potters wheel, textured, and individually reshaped by the artist to create an original design in each piece. No two are alike. The sculptured shells are available in different sizes and glazes. Two firing techniques are used, offering a wide variety of textures and hues. The Raku technique is currently run in crackle white, copper and rainbow. The High Fire Cone 10 is available in a variety on interesting and rich looking glazes Other lines of original sculptures include castles, towers, lighthouses, torsos and dragons with neon lights inside. Paul teaches adult classes at the Guild. Check out Classes for more information.